Before contact forms, website owners used to publish the email address and other contact details on the ‘contact us’ page which often brought tons of spam but few responses from genuine users. Precisely, it gives an easy way for the spammers to send you spam content and also attack your system with malicious links and networks. Well, contact forms keep you away from such spam, security threats and also help you to make your website more user-friendly. Widely known as the most popular content management system, WordPress has plenty of contact form plugins for creating a good-looking and powerful contact us page. These plugins are helpful for multiple purposes including helping users to communicate with the site owner, data collection such as email addresses of the users, website feedbacks from the users, and more. There are many such plugins on the web so the beginners may get confused on choosing the right one. So, I have handpicked the best 5 WordPress contact form plugins here to help to pick the perfect one. Mighty and powerful like the Everest (the highest mountain in the world), Everest Forms is probably the best WordPress contact form plugin available. I may sound biased here; claiming our home product being the best plugin for building forms but it’s not a flimsy statement. Everest Forms really does have what it takes to be the best form builder. A complete set of features to enable users to create unlimited WordPress forms and the under-friendly interface of the plugin makes it simply the best option available. With simple clean drag and drop interface for creating contact forms, it is just an incredible solution available for free. The plugin lets you create simple contact forms, multi-column contact forms, and advanced contact forms with several fields in one form. The whole form building interface is based on dragging and dropping so you can create complete contact forms easy and speedy. Further, the plugin offers extensive settings for each contact form built. It has two sections in the ‘settings‘ tab: General and Email. 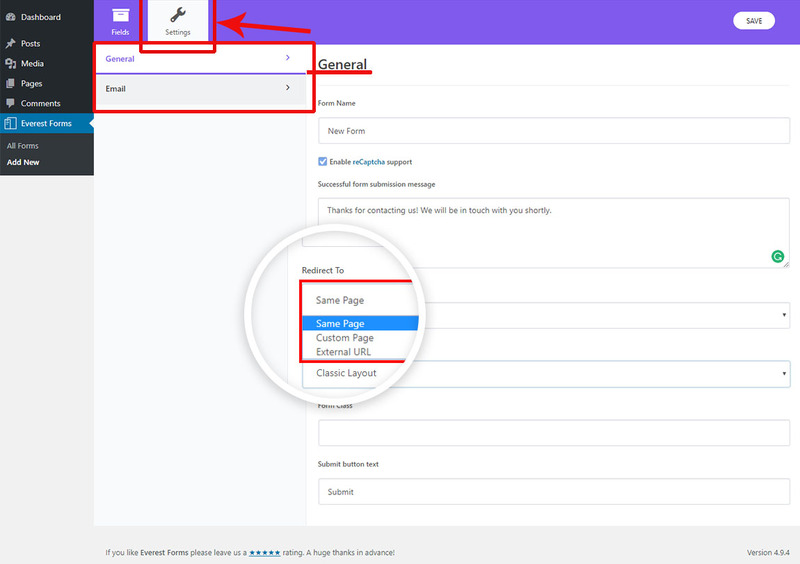 The ‘General setting‘ provides options for naming the new form, enabling reCaptcha, successful form submission message, redirection page for submit button, layout design options, form class, and submit button text. Redirection can be made to the same page, custom page or external URL as shown in the image below. Similarly, there are two layout design options: Default layout and Classic layout. And, Email setting includes options to customize sending email address, name, email subject line, email message. The plugin is available completely for free. It has a very user-friendly and simple interface, so even beginners can easily create contact forms. It’s completely free of cost, save money. Awesome support from the plugin makers. The plugin doesn’t have a premium version yet so it may lack some advanced features usually provided in premium version only. In the nutshell, Everest Forms is the best WordPress contact form solution available for creating contact forms as well as advanced WordPress forms. Developed with optimum coding standards and elegant design, it’s a high-quality WordPress product you can rely on. If you want to know more about how to use this plugin, here is a quick video guide. Ninja Forms is a powerful and easy to use WordPress contact form plugin. 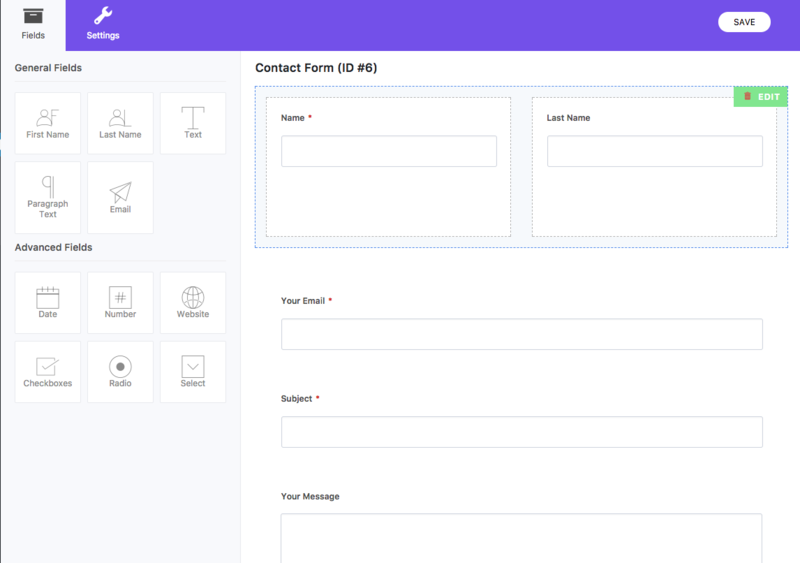 It is a drag and drop form builder which allows users to quickly create nice-looking contact forms without having to use any code. It is a great plugin for the WordPress beginners as it has a really simple and clean interface where they can simply assemble the drag and drop elements and build contact forms. Ninja Forms provides a plenty of settings so that users can change the style of overall form to individual fields. You can rearrange and resize the form rows and columns so as to create a new design. Form design is beyond limitations with Ninja Forms like page design with Page builders. Additionally, it is also very useful for the developers; they can use built-in hooks, filters and custom field templates to create their own custom functionality. Ninja Forms provides an ultimate solution to all levels of users seeking WordPress contact forms. Create unlimited forms, fields, emails, actions or submissions. Manage, edit, and export the form user submissions. 40+ Premium add-ons for extending contact form functionalities (PayPal Express, Conditional logic, MailChimp, Front-end Posting etc. Ninja Forms is available in both free and paid version. The free plugin can be downloaded free from official WordPress repository where it shows over 800,000 active installs of the plugin. For the more advanced features, you must buy the premium version of the plugin. The basic premium plan is ‘Personal‘ which costs you $99/ year which comes bundled with multiple layouts, multi-part forms, conditional logic and file uploads. It provides you 20% discount on the purchase of other additional add-ons. Use it FREE or Premium plan and also add additional functionalities with add-ons. Reliable support for both free and premium versions. The Free version of the plugin has very basic features and upgrading seems compulsory while the basic premium plan is quite expensive. In the nutshell, Ninja Forms offers the most intuitive contact form building interface with the maximum flexibility possible. The FREE version of the plugin is a good pick for the beginner websites while the premium version is perfect for highly growing or established businesses. However, the premium plugin seems to be quite expensive if you have a limited budget. WPForms is probably the most beginner-friendly WordPress contact form plugin. The plugin offers a simple and easy to use platform for creating beautiful and powerful WordPress contact forms. You can create contact forms, subscription forms, payment forms and other types of forms in a matter of minutes without touching any code. WPForms is yet another drag and drop form making tool for WordPress. It allows you to create an elegant contact us pages with nice-looking contact forms simply by dragging and dropping the elements. You can either start building the forms from the scratch or use one of the available form templates. Furthermore, you can customize the form and fields in your own style. The plugin is fully responsive that works well with all types screen including desktop, laptop, tablet, iPhone and mobile devices. The plugin has both FREE and premium versions. If you want a simple and basic plugin, you can download the free plugin from WordPress.org. The premium version of the WPForms is available for $39/ year as the ‘Basic‘ plan. The basic plan includes multi-page forms, constant contact, conditional logic and spam protection. Other plans are named as ‘Plus‘ and ‘Pro‘ which cost you $99 and $199 per year respectively. In addition, there is also a lifetime plan called ‘Ultimate‘ which is available for $499. Available for FREE, and cost effective premium plans starting from $39 per year. Dedicated support for the premium version, forum support and adequate resources for the FREE version. WPForms FREE plugin has limited features. You need to buy the pro version for more plugin features. In the nutshell, WPForms is the super-easy and useful contact form plugin for WordPress. It is a perfect pick for the beginners and growing businesses. In the beginning, you download the free plugin from WordPress.org and later upgrade to the premium version as your need grows. The starting premium plan ‘Basic’ seems cost-effective for the low-budget businesses as well. Contact Form 7 is undoubtedly the most popular WordPress contact form plugin with over 3 million active installs in official WordPress plugin repository. It is a completely free plugin that lets you create unlimited contact forms and surely on unlimited websites. After you install the plugin, it adds a section ‘Contact‘ in the WordPress dashboard where you can add contact forms. It provides one sample contact form which you can edit and create your first contact form. Then, you must add the contact form shortcode in the post/ page you want to display the contact form. With some HTML knowledge, you can create custom contact forms with a custom design. Furthermore, the plugin supports Akismet spam filtering, reCAPTCHA, comment blacklist for preventing security threats. Comment Blacklist helps to control spams by blacklisting the specific keywords and messages sent from specified IP addresses. Add unlimited forms on your website. Use it on unlimited websites. It supports Ajax-powered submission, reCAPTCHA, and Akismet spam filtering. The most noteworthy, Contact Form 7 is a completely FREE WordPress plugin so there is no money spent. You can build simple and elegant contact forms free. There are several WordPress plugins from third party plugin providers that work as the add-ons to Contact Form 7. You can get them free of cost at official WordPress plugin repository. For example MailChimp Extension, Conditional Fields, Dynamic Text Extension, etc. The plugin is available for FREE, however, it allows creating only the basic contact forms. If you want to add additional features, there is no official add-on to this plugin but you must depend on third-party plugins. In the nutshell, it is a free solution to creating WordPress contact form. If you want a simple contact us page with a simple contact form, it is a smart choice for savings. Gravity Forms is a feature-rich and powerful premium contact form plugin for WordPress. The plugin provides an easy to use interface for building good-looking contact forms in no time. It is a fully mobile responsive plugin that ensures 100% perfect look on all types of screens. The plugin has a deep WordPress integration that makes it really simple to build contact forms via multiple methods including shortcode, widget, function call, etc. Similarly, the plugin has a great integration with several popular web applications and online services. Some of the most used add-ons available are AWeber, Campaign Monitor, MailChimp, PayPal, Stripe, and Quiz. Awesome form builder: multi-page forms, limit entries, schedule forms etc. 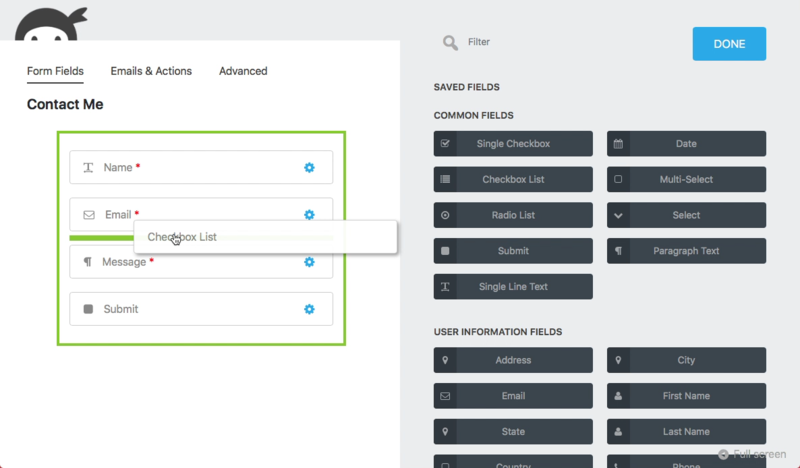 Advanced form fields: Standard fields, advanced fields, post fields and pricing fields. Powerful conditional logic: field conditional logic, section conditional logic, page conditional logic and submit conditional logic. Order Forms: Product fields, option fields, shipping methods, total fields. Unlike the two plugins mentioned above, Gravity Forms is not available in free version. It is a just Premium plugin. The plugin has three pricing plans starting from $39/year for ‘Personal License‘. Personal License can be used on one website and comes with basic features. Other advanced plans are ‘Business License‘ and ‘Developer License‘ which cost $99 and $199 per year respectively. The Business License can be used on three websites and comes with basic add-ons while Developer License supports unlimited sites and comes with both basic and advanced add-ons. A perfect plugin for professionals with a plenty of features and functionalities. Since it is a paid plugin, you will get an awesome support from the plugin makers. It is a paid plugin so free version is not available. You must purchase the plugin to check out all the features while other plugins with free version let you a try out the interface for free. In the nutshell, Gravity Forms is a great plugin for professional business websites. It has plenty of features and functionalities that you may require for creating a perfect contact us page. With a well-designed contact us page, you can improve user-friendliness, enhance communication with the audience, and consequently boost conversions or get closer to your site goals. And these contact form plugins will work as handy tools for you to create fully-functional contact forms on your WordPress website. I hope this was helpful to you. Additionally, we have some other WordPress plugin suggestions you may like to see. Have any say on this article? Feel free to write them below. Hiya,, your all plugin are look beautiful. But one of my favourite i.e “Fast Secure Contact”. I really like it. Gravity Form and Contact Form 7 are all time best. Just checked it. The contact form on your site seems to be responsive. If you still think there is some issue, please consult the theme provider or plugin provider specifically. Thanks! style as well as fantastic articles or blog posts. Perhaps one of the greatest benefits to using Contact Form 7 is the number of extensions that exist to bring extra features to the base plugin. Like most popular plugins, Contact Form 7 is updated on regular basis.